Antinori family passion for traditional Italian cuisine meets great ocean views; romance ensues. 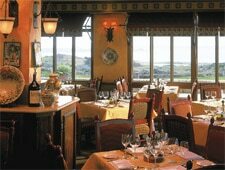 : Pèppoli, named for a vineyard belonging to one of the oldest winemaking families in the world, the Antinori family, has graced The Inn at Spanish Bay at Pebble Beach Resort for years. The handsome dining room, appointed in deep woods and warm fabrics, casts a spellbinding view of the ocean and the brooding Scottish-influenced links. This splendor, along with real Tuscan dishes and service staff all trained as sommeliers (many who have traveled to the Antinori property in Tuscany and Umbria), provides a winning combination. In the hands of Peruvian-born Arturo Moscoso, the kitchen delivers consistency and authenticity. A simple baby beet salad picks up texture from delicate mâche leaves, and a pronounced sweetness hails not from the multicolored beets, but from fig purée. Warm, crispy goat cheese finishes the dish. Three beautifully seared scallops shimmer in a lobster stock-based sauce, a complex cauliflower purée imparting all the luxury of richly whipped potatoes. Traditional Antinori family recipes have become signatures, such as the tonno spezziato, seared tuna accented by an underplayed crust of pepper and coriander. Served with a syrupy balsamic, reduced to a rich caramel concentrate, the slightest hint of sweetness aligns with the sharper peppery coating. But before you get to this secondi, order one of Moscoso's pasta dishes. We like the pici pomodoro, simple handmade Tuscan-style noodles, thick, coiled and satisfying, served with a light tomato sauce and lush organic ricotta cheese. For dessert: Moist rosemary olive oil cake presents elegantly; savory and sweet marry discreetly with little adornment other than a lemon sauce drizzle and tasteful rosemary festoon.